has been helping people for nine years to acheiving victory from and over their addiction. 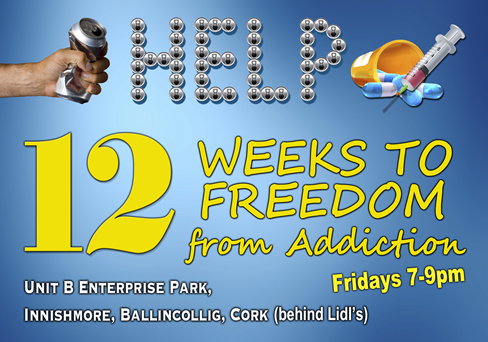 We offer a FREE 12 week addictions programme that effectively modifies any addiction behaviour. Anyone can join the course at any time, but will get the best help if attending from start to finish. This course can both help those who are struggling with any addiction, or someone affected by those bound by an addiction. ye shall be free indeed." We Can Help YOU or Someone You Know! 90% of all our problems in life are because we try to live our own way, instead of God's way. The Lord Jesus, through His resurrected life can transform any sinful life - no matter how far gone it may be, into a life of victory and freedom! Are you Fed-up with Religious Dead-Ends and Frauds? How to Grow Up God's Way? and a lot of help! Join us and learn step-by-step how to have victory over the many struggles and conflicts that we deal with in our modern society. Each meeting includes a 30-40 minute teaching lesson on issues of behaviour modification, from the inside-out - which is what it takes to change a person. People will find great help learning there not only is hope, but there are proper steps that can be taken to get free and stay free from addictions! Our group session gives volunteer students an opportunity to share how God has changed their lives. Our visitors love to hear stories of God's miraculous and saving grace, as well as how God has blessed them as they follow the life of Jesus their Saviour. We make time to listen. If anybody needs personal counsel, it is always available. Please contact us for more information. Each group has its very own leadership staff of volunteers who are trained to work with you one-on-one or in group counselling. We have prepared resource material to help your complete recovery. We have Program Guides, Handbooks, Workbooks, Memory Books, Counsel Guides, Handbook Study Guides, and many audio tapes and CD's of previous lessons. There is a residential centre for men in Tallaght, Dublin, that is specially staffed and equipped to deal with heroine and other extreme addictions. Contact us for application information. The personal testimonies of people whose lives have been dramatically changed and helped by this programme! Course is FREE, but you must register. SIGN-UP TODAY to register! TWTF is a Ministry of the Bible Baptist Church of Ballincollig, Cork in Ireland!